Enter into a majestic foyer with a 20' high ceiling exposing a stunning formal living room and a large dining room seating for 12. The first floor also has a well designed fully equipped kitchen, extra large pots and pans, service for 24 and seating for 6. Kitchen includes 2 door refrigerator freezer with automatic ice maker, water dispenser, microwave, oven, and dish washer. 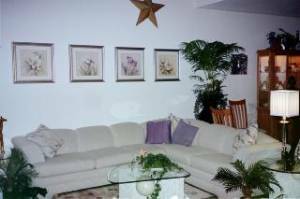 The large comfortable family room consists of an extra long leather sofa and chair. This room exits to the pool area. The first floor master bedroom includes a king size bed and full bathroom. 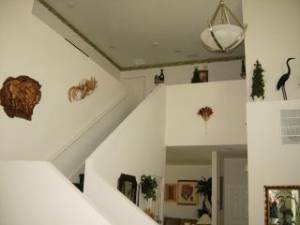 This level also includes an additional bathroom and a laundry room. Second level consist of a large elegant master bedroom, king size bed and lavish master bathroom including a separate tub and shower. 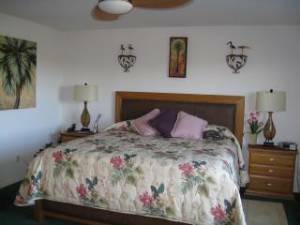 There is another bedroom with a king size bed and 3 additional bedrooms with 2 twin beds in each room. The second floor common full size bathroom consists of full Tub/shower. 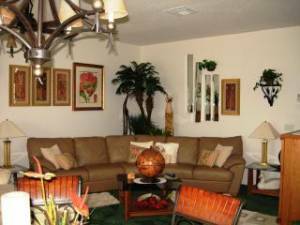 All bed rooms and family room have cable televisions, VCR, DVD players, large walk-in closets and ceiling fans for your comfort. Also included, FREE INTERNET, central air conditioning, heating system, local phone services, LINEN, CLEANING FEES, clock radios, stereo. The extra large screened in pool area also has a jacuzzi. (HEATED IF YOU LIKE) Pool area is also fenced in for the protection of your children. This area has 3 lounges, 2 tables, seating for 12, and a gas grill. Newly installed GAME ROOM ( POOL TABLE, PING PONG, AIR HOCKEY and misc. board games) This contemporary home sets on an extra large lot with no neighbors in the back yard. The elevated pool area welcomes you with a friendly breeze and has a great view of palm trees, farm animals and many wild fowl that drop in to say hello. 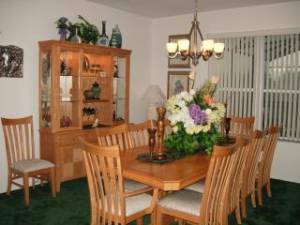 This home is conveniently located off interstate 4 exit 58. 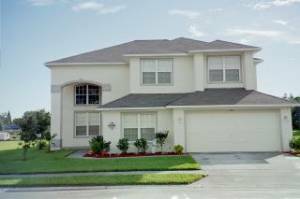 Property is just 15 minutes from DISNEY WORLD, SEA WORLD, and many other top attractions. There are several professional golf courses in the area. There is now a brand new local shopping/mall for your convenience. East coast beaches are less than one hour away. $ 950.00 not heated pool or jacuzzi. 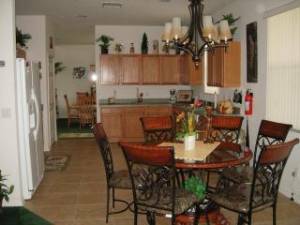 $ 1,100.00 included heated pool and heated jacuzzi.